Surprise! 10 books for .99cents! Lost Without You is now in PRINT!!! 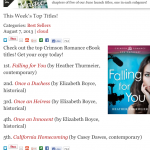 Falling for You is #1 on Crimson Romance’s best seller list this week! Thank you, readers!! If you haven’t had a chance to check it out yet, what are you waiting for?! Grab a copy at AMAZON or NOOK today and find out why it’s a best seller on kindle and at Crimson Romance!